The Definitive Eyes Aloft! Radio Log with Ken Carpenter, Gayne Whitman, and Ben Alexander. Dee-Scription: Home >> D D Too Home >> Radio Logs >> Eyes Aloft! Eyes, Aloft! remains a fascinating time capsule reflecting the national hysteria following the infamous Pearl Harbor Attacks of December 7, 1941. The hysteria was most attenuated throughout the West Coast of The United States, where the IV Fighter Command was based and was tasked to defend. A brief explanation of the IV Fighter Command is probably in order at this point. It should be noted that all references to the 4th Fighter Command throughout Eyes, Aloft! refers to the unit designated IV Fighter Command. It's an important distinction, since the designation of this relatively short-lived command was significantly 'civilianized' for both the Eyes, Aloft! 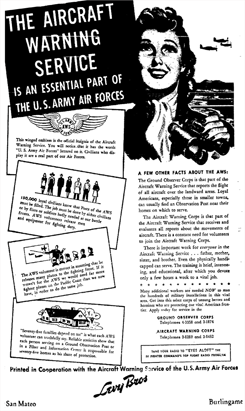 programs and the volunteer force that comprised the Ground Observation Corps and the Aircraft Warning Service units. Disbanded on 31 Mar 1944. 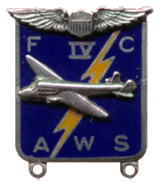 During most of World War II, the 4th Air Force was the primary Air Defense Command for the West Coast. The command was also tasked with antisubmarine patrols along coastal areas of the Gulf of Mexico from the period immediately following the attacks on Pearl Harbor until approximately October 1942. After October 1942, the antisubmarine patrols were released to the Coast Guard and other agencies. The command was thereafter engaged in training replacements for combat units. It supported Army Air Forces Training Command's mission--headquartered at March Field near San Bernardino, Calfornia--of training units, crews, and individuals for bombardment, fighter, and reconnaissance operations. 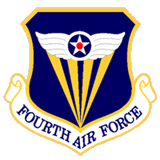 On December 13, 1944, the First, Second, Third and Fourth Air Forces were ultimately placed under the Unified Command of the Continental Air Forces, the progenitor of the later established Strategic Air Command, Tactical Air Command, and Air Defense Command, which were all established as a consequence of the National Security Act of 26 July 1947, which officially authorized the United States Air Force as well as The Central Intelligence Agency. There were understandably important distinctions in the desiginations employed by both the Eyes, Aloft! 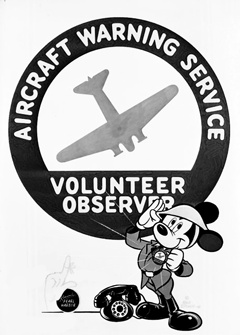 programs and the all-volunteer Ground Observation Corps that evolved into the volunteer force which was ultimately designated the Aircraft Warning Service of The United States Army Air Forces (or Army Air Corps). Ostensibly sponsored by 'the 4th Fighter Command', there was indeed no such official designation. 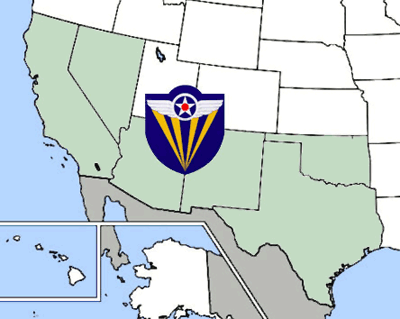 As indicated above, the official designation for this unit was IV Fighter Command, the unit based--and headquartered--at Oakland Airport, California. But at the same time, it should be noted that the actual force structure and unit designations of the Army Air Forces components--and their missions--were very much matters of the highest security, as well as information that our enemies were quite willing to kill to obtain. As such, it's entirely understandable that the actual missions and component details of the War Department's force structure should be withheld from America's civilians--whether they were directly involved in volunteer Civil Defense units or not. Oakland Airport, California, Jun 1942-31 Mar 1944. The references to Hammer Field in some of the Eyes, Aloft! episodes refer to Fresno Air Terminal, now known as Fresno Yosemite International Airport. During the early years of World War II, Hammer Field was employed as a training base in support of The 4th Air Force described above. San Francisco Fighter Wing: 1942-1944. As indicated above, in the aftermath of the Pearl Harbor attacks, the responsibility for West Coast civilian air defense fell initially to IV Interceptor Command, then to the redesignated IV Fighter Command. It was during the IV Fighter Command's constitution that Eyes, Aloft! was produced and broadcast. as a means of recognizing the existing and newly formed Air Warning Service component units that were actively engaged in ground observer activities throughout the U.S.. Recognition of these units was a major element of each Eyes, Aloft! program. The IV Fighter Command and the National Broadcasting Company jointly inaugurated the weekly National Broadcasting Company Eyes Aloft Gold Trophy Award. At the close of each broadcast, an individual volunteer or AWS regional unit would be formally recognized for their efforts with NBC's Eyes Aloft Gold Trophy Award for that week. A modern minute man who flies through the air with the greatest of speed Is Sam Hayes, well-known radio commentator who will speak before several local groups on Monday afternoon, fly to Los Angeles to keep a radio broadcast engagement and return here the same evening by air to appear on the stage of the local theaters. His modern Paul Revere message is the danger of the air enemy and the emergency value of the aircraft warning service that needs both men and women to staff the filter centers and the observation posts. Captain D. R. Buford, in charge of the local air filter station, has made arrangements for the local series of talks on Monday with the Bakersfield and Kern county chambers of commerce assisting him. Mr. Hayes will arrive in Bakersfield at 11:30 o'clock Monday morning and will immediately begin his whirlwind round of appearances. He will talk over KERN at 12:25; he will be guest speaker at the Kiwanis Club at 12:45 and before the Bakersfield Woman's Club Bible section at 2 p. m.
enlistment in the service. 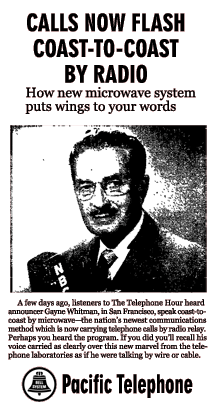 Mr. Hayes will then fly back to Los Angeles for his weekly "Eyes Aloft" network radio program under the auspices of the Fourth Fighter Command, and then he will fly back to Bakersfield and appear on the stage at the Fox theater between 8:30 and 9:15 p. m. and later at the Nile theater at 9:30 o'clock. Mr. Hayes has told local workers that the fourth fighter command is particularly interested in Bakersfield and the San Joaquin valley area because of the large number of daily airplane flights. "We hope to recruit more men and women for the vital positions of filter center workers and ground observers in Bakersfield," Mr. Hayes said, "and at the same time we intend to pay tribute to those volunteers who are now serving in this essential activity." After each of Mr. Hayes' appearances, men and women who wish to volunteer for filter center work may make their application immediately. Emphasizing the importance of the aircraft warning service, Mr. Hayes pointed out that because of this organization, the army air forces are constantly posted on the whereabouts of all planes in the air, and likewise can be warned immediately on the presence of enemy planes. This is made possible when ground observer crews, constantly scanning the skies, telephone all reports into local filter centers where the movement of every plane is minutely plotted. Plots of every flight are made, and if the flights are not identified, the plane is called an unidentified target and is treated as such until it is recognized. "This system," Mr. Hayes reports, "has saved the lives of many fliers who have met with a sudden accident in the air, or were lost because of poor flying conditions or a mechanical defect." The message component of each broadcast was usually a cautionary tale of either examples of ground observer success stories, or a dramatic illustration of the continuing need for the Aircraft Warning Service itself. A key element of the prologue to each episode was the announcement that its script had been cleared by G-2, or the Intelligence component of the Army Air Forces. This further underscored both the gravity of the subject matter, as well as further impressing upon the civilian audience that these were serious intelligence issues of the highest order. If this seems overkill in retrospect of the prism of history, one can be forgiven the cynicism. This was a period of great civil unrest on both coasts, along the entire Gulf of Mexico, and along the mainland borders--north and south--of the continental United States. But in point of fact, history would later demonstrate the virtual impossibilty of long-range bombers from any of the Axis Powers reaching the continental United States, let alone enemy fighter attacks. Indeed, this period was at once one of America's shining moments and most shameful moments in the history of World War II--or any conflict before or since for that matter. On the commendable side was the immediate surge in volunteerism and cooperation between all levels of township, city, and state Civil Defense agencies, units of the Red Cross, and the above referenced Air Warning Service. These volunteers were almost universally acting in selfless, patriotic support of their Nation in any way in which they might help protect it. 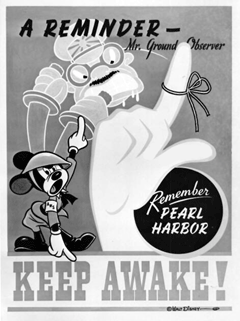 On the flip side of the aftermath of the Pearl Harbor attacks, the more fascist Conservative elements of American society found no problem with rounding up hundreds of thousands of unquestionably loyal American citizens of foreign birth and confining them in Concentration Camps throughout both the continental United States and its territories for the duration of World War II. This was, by any moral society's measure, a national disgrace of the highest order. All of the above being said, there's no question that this fascinating, 61-episode series met its stated goals. 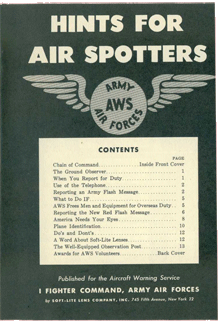 The programs both encouraged the existing base of AWS Observers and Filter Center volunteers and informed the public at large regarding the activities of the Air Warning Service and the perceived dangers of the era. That none of those 'dangers' ever truly presented themselves is moot. Irrespective of the effectiveness--or underlying need--of the Air Warning Service, the continuing and very real 'fifth column' element throughout the continental U.S. during World War II demanded dramatically increased security from both civilians and Civil Defense officials alike. This program and others similar to it met that need. In the process, a troubled, anxious society found a measure of reassurance in the wake of the December 7th period, while at the same time stiffening their resolve that the U.S. would ultimately prevail against its enemies. If the AWS accomplished nothing other than serving to reassure American Society, it more than met its stated goals. 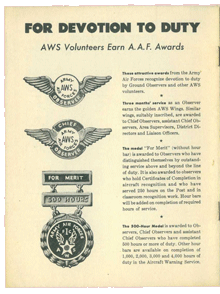 But indeed, in the process, the AWS empowered an even greater sense of volunteerism throughout America, while creating a heightened awareness of the need for both increased security and compliance with prudent Civil Defense precautions. Run Dates(s)/ Time(s): 42-08-17 to 43-10-11; NBC Red; Sixty-one, 30-minute programs; Mondays, 6:00 p.m.
Recurring Character(s): Varied for each program. Protagonist(s): Varied for each program. Volunteer observers and filter center workers from 3000 posts scattered throughout the Pacific Coast States from Puget Sound to the Mexican border will join in a pledge of allegiance led by General W. B. Kepner, commanding officer of the Fourth Fighter Command during the premier broadcast of "Eyes Aloft" over the Pacific Coast NBC Network tomorrow at 6 p.m..
As 10 of their fellow fighters in the civilian army are decorated for conscientious and valuable service, groups of the army of 130,000 volunteers will gather at radios in their posts to hear the pledge of allegiance read from an unknown address in San Francisco. "Eyes Aloft," presented by the National Broadcasting Comopany and the Fourth Fighter Command, will dramatise the work of aircraft spotters and filter center volunteers, and each week 10 volunteers will be awarded a 500-hour citation medal by U.S. army officials. Following dramatizations of outstanding achievements by observers and filter center groups, the National Broadcasting Company will award each week an impressive gold trophy to the ground observation unit selected for the most outstanding contribution. The first NBC trophy will be presented Monday by Capt. Russell Z. Smith, ground observation officer of the Southern California Section. Theme song for the new program is "Eyes Aloft," written by Johnny Mercer and orchestra leader Gordon Jenkins. The new song will be introduced by the Sportsmen, male quartet, with Jenkins' orchestra. had to help with the hay crop. SALEM, Aug. 31 (AP)--State Defense Coordinator Jerrold Owen asked Oregon's thousands of aircraft warning observers today to listen to radio station KGW from 6 to 6:30 p.m. each Monday to hear the program "Eyes Aloft," sponsored by the army's fourth fighter command. Owen said the observers will obtain valuable information and instructions from the program. "Eyes Aloft," a radio program for the purpose of obtaining volunteers in aircraft warning service under the sponsorship of the Fourth Fighter Command, will be heard tonight over Radio Station KFI, Los Angeles, at 6 o'clock, it was announced today by Claude Peavy, co-ordinator of hte Bakersfield City Defense Council. 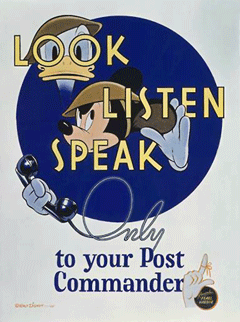 Volunteers in the aircraft warning service are badly needed and citizens are urged to listen to the program, Mr. Peavy said, upon receiving a telegram from Kenneth R. Hammaker, executive director of the California state council of defense, this morning announcing the program. Portland will be cut into the NBC "Eyes ALoft" program at 6 and Ken Jernstedt of Yambill will tell how as a Flying Tiger his life often depended upon the vigilance of Chinese peasants. He will describe the remarkable Chinese aircraft warning service in an interview with Lieut. Robert Clark, ground observation officer. Dramatic stories of hte activities of filter centers and observation posts by civilian volunteers in the ground observation corps will be presented during the Hollywood portion of the program, and NBC's gold trophy will be awarded to the filter center or observation post considered the most outstanding of hte week. Arrangements were made today for a three-station hook-up, originating at Roseburg, for the release of the dramatic production, "Eyes Aloft," the weekly radio program of the aircraft warning service, Lieutenant J. T. Runyan, commanding officer at the Roseburg filter center, announced today. The first of the programs to be released under this new arrangement will be heard locally form Station KRNR from 7:30 to 8:00 p.m. Tuesday. The programs are being released by the NBC Red network each Monday at 6 p.m. Due to the fact, however, that there is no NBC station of sufficient power to cover the southern Oregon territory at that particular period, radio listeners have not been able to hear the interesting series of programs, Runyan stated. Through arrangements completed today, the regular Monday broadcast will be carried by wire to the KRNR studio where a transcription will be made for delayed release. The program then will be broadcast from Roseburg by transcription each Tuesday evening and will be heard over KRNR, Roseburg; KOOS, Marshfield, and KUIN, Grants Pass. The series, "Eyes Aloft," is dedicated to the observation and filter center workers and dramatizes th work of the thousands of men and women manning the aircraft observation stations throughout the nation, and the volunteer workers in the filter centers. All Fredonia observers in the Aircraft warning service and others who are interested in the work are invited to a meeting to be held in the auditorium of the Teachers college in Fredonia at 8 p.m. next Tuesday. The army group which has been attending similar gatherings in Chautauqua recently will be present to show a new film called "Eyes Aloft." Arrangements are in charge of Chief Observer Elmer Herriott who announces that a lunch will be served for the observers and army men following the meeting. Captain G. V. Underwood and Lt. J. D. Moser of the fourth fighter command visited in Santa Cruz county recently to gather material for an "Eyes Aloft" radio program. Announcement of their visit was made by H. H. Glessner, county director of the ground observation corps. Accompanying the two officers was C. A. Redd, NBC representative at Hollywood. The material will be used some time within a month on the weekly program which is heard on station KPO Mondays at 6 p.m. The IV Fighter Command of the United States Army Air Forces, in cooperation with West Coast Radio Stations is presenting a series of evening radio programs honoring hte 150,000 Civilian Volunteer Observers and Filter Center workers of the Aircraft Warning Service whose 'round the clock vigilance keeps watchful guard of the Pacific Coast against air borne enemy attack. This series of programs will be aired over KFBK on Fridays beginning with tonight's broadcast at 9 o'clock. Chief Observer Shannon Horn and his staff of Elks lodge members who man the Pecho aircraft warning service station were interviewed by National Broadcasting Co. representatives Friday night who were here to compile a broadcast for the "Eyes Aloft" program. Discussing the work at the Pecho post were Robert Redd, author of hte "Eyes Aloft" series, John Swallow and Captain Smith. During the presentation of the Eyes Aloft broadcast tonight over KFBK at 9 o'clock the story of how a woman too busy to do Red Cross, Observation Corps, Nurses Aides or other work finally found a way to help in the war effort. The actual story to be dramatized features two patriotic women of Oroville, Butte County, Mrs. Marge Reel and Mrs. Geneva Lepper, area supervisor for the Oroville Post of the Civilian Observation Corps. Tonight's Eyes Aloft program, the second in the series, is presented in cooperation with the 4th Fighter Command. 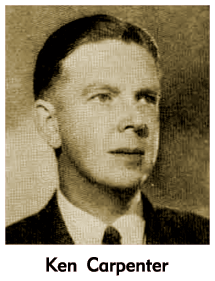 Thanks to Conductor-Composer Gordon Jenkins, 150,000 civilian air observers of the Aircraft Warning Service, 4th Fighter Command now have a theme song. Jenkins has written the words and music for a stirring march aptly called Eyes Aloft. Proceeds of these sales are being donated by Jenkins to the command for use in the construction of air shelters along the Pacific Coast, or wherever needed. Jenkins is the musical director of the NBC Public Service feature Eyes Aloft (Mondays, 6 P.M.), dramatizing features of the observers' work. The services of the Motor Corps in driving observers to the ground observation posts, in connection with the Fourth Fighter Command, will be dramatized on the "Eyes Aloft" program to be broadcast over the National Broadcasting company network Nov. 23, at 6 p.m. The program has, heretofore, dealt with the work of the ground observation corps, but deviates for the first time to feature the services of the American Red Cross. Members of the Santa Maria Red Cross chapter will appear on the program. A 54 YEAR OLD Kern county man today held "Eyes Aloft" Gold Trophy in honor of his loyalty and valor as a member of Aircraft Warning Service of the United States Army's Fourth Fighter Command. The man Is Charles Holmes, caretaker at the Kern county district No. 1 prison camp, who has been a volunteer observer since the United States entered the war a year ago. hours, listening for planes and reporting to army headquarters from a lonely post in the High Sierras. Helen Andrews, known on the air as Helen Musselman when she played dramatic roles on One Man's Family, I Love A Mystery, Death Valley Days and other dramatic shows originating in San Francisco, has returned to the air after an absence of three and a half years. She had a part in a recent Eyes Aloft drama. A special Eyes Aloft program has been arranged for 6 P. M. as an observance, of the anniversary of the nation's entry into the war. Portions of the broadcast will come from various Pacific Coast units of the Aircraft Warning Service, and military officials will speak briefly. TWO hundred and fifty Bakersfield citizens gathered in Washington auditorium Sunday afternoon when the National Broadcasting Company presented Bakersfleld observation post with a gold cup on behalf of the "Eyes Aloft" program from the Fourth Fighter Command, United States Army air forces. Ed Benedict, chief observer at the station, received the cup for the post from Captain Paul V. Barnes, ground observer for the area. Representatives of the armed forces who spoke on the program honoring one of the outstanding observation posts in the state, lauded local men and women who have co-operated In manning the post which has one of the finest records in the state. Tonight's "Eyes Aloft" program on KRNR will introduce two new features of much interest to Douglas county listeners. Prizes of $5 in war stamps are being offered each week for the best 100-word letter answering the question, "Why Do I Come Here?" The contest is open to all workers in the aircraft warning service, entries to be mailed to Eyes Aloft, Hollywood, California. Sam Hayes, well known commentator, will offer another new feature each week on "Eyes Aloft". His portion of the program will consist of chatter and news of filter center personnel, covering weddings, engagements and personalities from the various filter centers on the Pacific coast. Lyons--The observers of the Lyons-Mehama observation post are proud of its chief observer, Mrs. Ivan Day. Mrs. Day's story, "Why Do I Come Here" was featured on the "Eyes Aloft" program over KGW Monday evening. 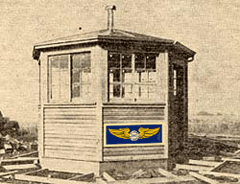 The observation post will be presented with a new clock and Mrs. Day with $5 in war stamps. Mrs. Day is a loyal observer herselfl, filling in many shifts when the observer doesn't show up for his shift. in the Gold Hill district was the subject for a dramatiraiion on the radio program "Eyes Aloft," heard over Pacific Coast stations on Monday evening of last week. was made of awarding a gold medal to the Gold Hill Observation Post of the Aircraft Warning Service for their efficient work in connection with the crash. The Gold Hill post functions under the direction of Mrs. Cora Miller, chief observer, and it is understood that the radio presentation undertook to portray in some detail the routine of the observers on duty in connection with making a proper report of the incident. Eyes Aloft: Takes morning spot Tuesday 11:a.m.
We're not just sure whether we were a week ahead or the powers-that-be were a week behind on the American Forum Eyes Aloft publicity. Any way, you'll know by now that we were off the beam--the big change will come next week--at least, we hope, that we're right this time. 6:00 KPOThree coast governors to be heard on "Eyes Aloft"
SPRING VALLEY--The activities and achievements of Spring Valley observation post personnel will be featured when the post is represented on the "Eyes Aloft" program of KGW Monday night from 6 to 6:30 o'clock. An account of the big all day community picnic and cooperation is providing the wood supply will be given. Local Chief Observer Vivian A. Stratton will assist on the program, which gives official facts and figures concerning some outstanding post each week. Born in Avon, Illinois, Kenneth Carpenter was the son of Barlow Carpenter, a Universalist minister, and Clara Carpenter. 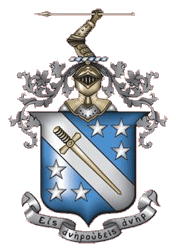 Ken Carpenter graduated from Lombard College in Galesburg, Illinois in 1921, where he was a member of the national Phi Delta Theta chapter, a fraternity of college students espousing "the cultivation of friendship among its members, the acquirement individually of a high degree of mental culture, and the attainment personally of a high standard of morality". Lombard College also is where Carpenter met his future lifelong wife, Betty. 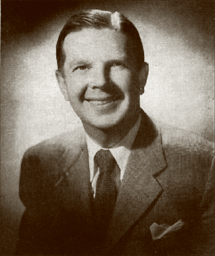 Ken and Betty Carpenter moved to Hollywood in 1929 and soon after, Ken became a staff announcer at Hollywood's KFI radio. After announcing the 1935 Rose Bowl game on NBC, he found himself in demand for national programs. He became Bing Crosby's announcer in 1936 shortly after Bing took over the hosting duties on the Kraft Music Hall. Carpenter remained with Bing Crosby through the next 27 years. He also announced for Al Jolson and Edgar Bergen's long-running show. He performed in the same capacity on the Radio and Television versions of Lux Radio Theatre and One Man's Family. Throughout the Golden Age of Radio Broadcasting--and beyond--Ken Carpenter remained one of Radio's busiest announcers, appearing in over 6,000 broadcasts during a forty-two year career in Radio. The staggering array of Radio programs Ken appeared in forever set him apart in the annals of Radio Broadcasting History. All told, Ken Carpenter enjoyed a Film career spanning twenty years. 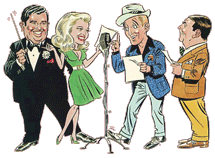 Ken Carpenter was also in demand on Television, enjoying yet another ten year career as the announcer for Lux Video Theatre (1950-1955) and The Bing Crosby Show (1954) among others. Over a forty-seven year career in the Performing Arts, Ken Carpenter stands as a legend in Radio and a true American Treasure of 20th Century Broadcasting. Ranked among the top five most important announcers in his craft, Ken Carpenter's career in Radio will probably never again be equalled. But equally important, as a beloved gentleman and icon to all of the Broadcast announcers that followed him, he remains one of the most influential proponents of his craft to this day. Born Nicholas Benton Alexander IV in Goldfield, Nevada, young Ben Alexander was raised in California. He made his screen debut at age of five in Every Pearl A Tear (1916). 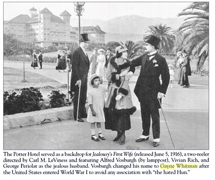 He then went on to portray Lillian Gish's young brother in Hearts of the World (1918) for the legendary D.W. Griffith. He worked for Cecil B. DeMille in The Little American (1917). He subsequently graduated to juvenile leads and supporting parts in many of the earliest sound films. 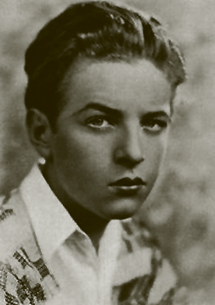 Alexander remained a very busy juvenile actor until 1930's World War I classic, All Quiet on the Western Front, in which Alexander performed in his first breakout role as an adult actor as Kemmerick, the tragic amputation victim. Although Alexander's acting career slowed down in the mid 1930s, he reinvented himself as a successful radio announcer, working steadily in Radio through the late 1930s and 1940s. 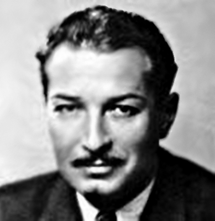 By the late 1940s, Alexander had all but retired from acting and announcing. He'd already diversified his business interests by opening a very successful automobile dealership in downtown Los Angeles. It took Jack Webb to coax Alexander out of retirement in 1952. Alexander's straightforward delivery and amiable personality caught Jack Webb's attention and he chose Alexander to replace Herb Ellis in Webb's Dragnet Television series. 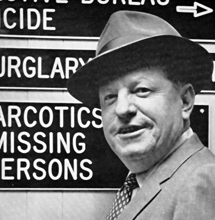 Alexander remained as Officer Frank Smith in the TV's Dragnet for the duration of the 1950s run. Alexander's very human characterization of Detective Frank Smith provided the perfect counterpoint to Jack Webb's calculatedly dry, non-nonsense characterization of Detective Sergeant Joe Friday. When Webb revived Dragnet as Dragnet 1967, he tapped Harry Morgan as his new sidekick. Alexander had already returned to Television police work as Desk Sergeant Dan Briggs in ABC's Felony Squad (1966-1969), with Howard Duff. Despite Alexander's extraordinary Film career it was as a Television actor that Ben Alexander was recognized with a star on the Hollywood Walk of Fame. Ben Alexander brought his refreshing, plain-talking, amiable personality to all of his Television roles, and he was highly sought after as both an inspirational speaker and Public Relations advocate for the Los Angeles Police Department. His successful Ford dealership remained in the family after his death in 1969. His light-hearted delivery and inherent likeability continue to keep him in the hearts and minds of his millions of fans worldwide now forty years after his passing. An appropriate tribute to a Radio and Television professional who recognized the value of an honest, human characterization in all the roles he performed. Home >> D D Too Home >> Radio Logs >> Eyes Aloft!